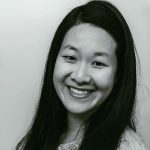 Published Sep 25, 2018 By Julia 22 CommentsThis post may contain affiliate links. 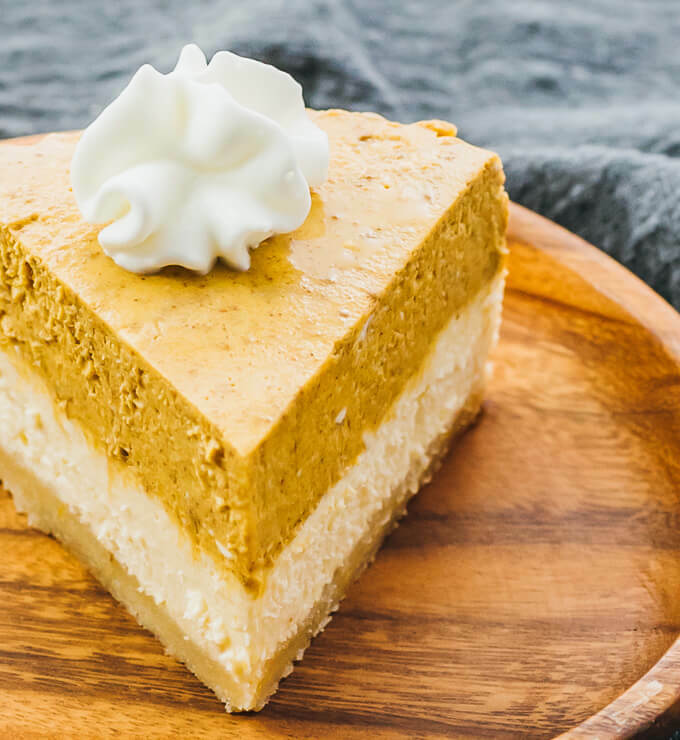 A healthy Instant Pot recipe for making a 6-inch pumpkin cheesecake with an almond flour crust. Keto, low carb, and gluten free. This is a layered cheesecake with a top pumpkin layer and middle plain cheesecake layer, supported by a thick almond crust. It’s a modest cake, only 6 inches in diameter, and uses a small pan that easily fits inside the Instant Pot. The cheesecake is assembled one layer at a time, starting with the bottom crust. There’s no need to bake or cook the crust first; the entire cheesecake is cooked at the same time in the pressure cooker. 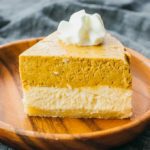 This recipe is inspired by the layered pumpkin cheesecake bars that I made last year (which were a total hit at Thanksgiving!) and this classic New York style cheesecake made in the Instant Pot. Both recipes use almond crusts. 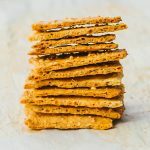 This recipe is keto friendly because each serving is low in carbs: a single tall slice comes out to 5.5g net carbs. To make it low carb, I use an almond flour crust instead of a traditional graham cracker crust. I’ve also replaced sugar with a natural sweetener called swerve, which is an erythritol blend that has negligible impact on insulin or blood sugar. Use blanched almond flour and avoid anything labeled “finely ground almonds.” I’ve used brands including Blue Diamond, Kirkland, Trader Joe’s, and Bob’s Red Mill — all work great. They should have 2g net carbs per 1/4 cup serving. I use a dry sweetener called swerve, which measures the same as sugar. 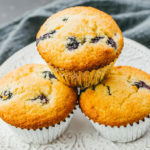 You can replace it with another type of dry sweetener as long as you make the appropriate conversion so that it has the same level of sweetness. For example, if you use pure erythritol, you’ll need to use more than what the recipe calls for because it’s only about 70% as sweet as sugar. Use powdered or confectioners versions instead of granulated. If you have granules, you can powder it using a small blender like the Nutribullet. For best results, measure out the almond flour and sweetener by weight and not by volume. Pressure cooker. Any electric pressure cooker will work for this recipe. I use a 6 quart Instant Pot. Trivet. Use the trivet that came with your Instant Pot. Or you can use a steam rack. This will elevate your cheesecake so it’s not sitting in water. 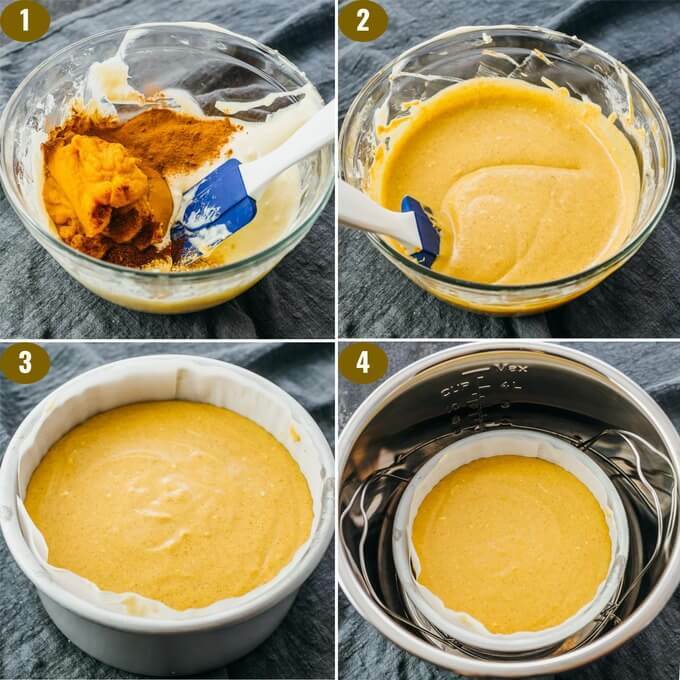 Cheesecake pan. I use a removable-bottom aluminum 6-inch round cheesecake pan by Fat Daddio’s that’s 3 inches tall. Personally, I find that pans with removable bottoms are more convenient than springform pans. Parchment paper. Parchment paper is nonstick and perfect for ensuring that the cheesecake doesn’t stick to the pan. Electric hand mixer. An electric hand mixer is essential for mixing cheesecake batter. For best results, follow the recipe’s instructions for cooling the cheesecake after cooking. Once it cools to near room temperature, remember to chill it in the refrigerator for at least 24 hours before serving. It takes time for cheesecake to develop its flavors, and I think it’s best after about 48 hours in the refrigerator. 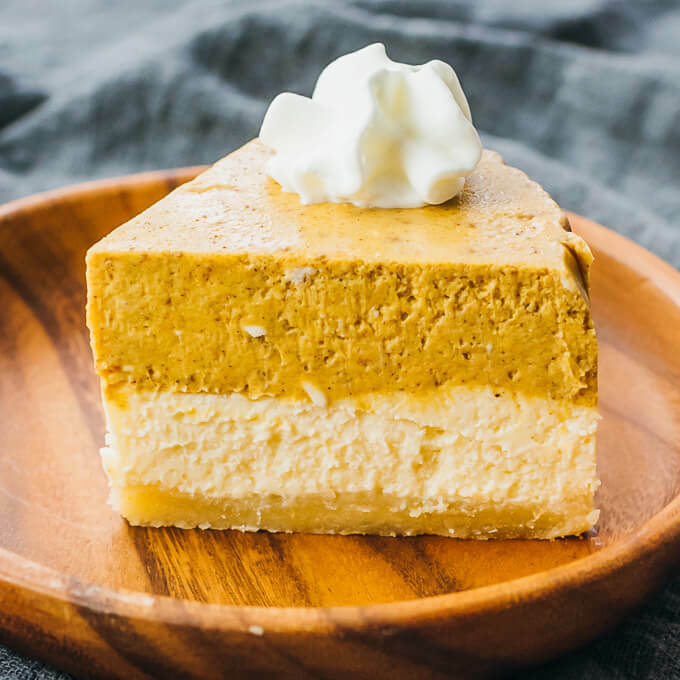 A healthy recipe for making a 6-inch pumpkin cheesecake in the Instant Pot, with an almond flour crust. Keto, low carb, and gluten free. 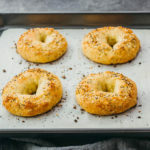 Remove cold ingredients (cream cheese, eggs, heavy cream) from the refrigerator about 30 minutes before proceeding with the rest of the recipe. Prepare a steam rack or the trivet that came with your pressure cooker, ideally with lifting handles. Prepare an aluminum 6-inch round cheesecake pan with removable bottom, or springform pan. Line the bottom and sides of the pan with separate pieces of parchment paper. Combine melted butter and sweetener in a mixing bowl, and stir together. Add almond flour, stirring until the butter is absorbed and it becomes dough-like. Transfer the dough to the cheesecake pan. Use a spoon or measuring cup to firmly press down to form a flat, smooth crust covering the entire bottom of the pan. Add cream cheese and sweetener to a bowl. 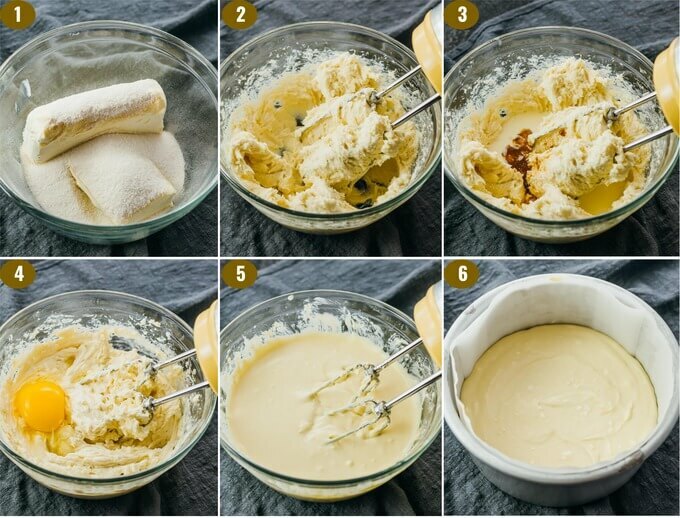 Use a hand mixer to beat on low speed until well-mixed, about 1 minute. Add heavy cream, lemon juice, and vanilla extract. Beat on low speed until smooth, about 30 seconds. Add eggs one at a time, beating on low speed until just combined, about 30 seconds each. Don’t overmix the eggs. Remove the pan with chilled crust from the freezer. Pour about 3/4 of the batter over the crust, careful not to leave trapped air gaps, and smooth the surface. Return the pan to the freezer. Add pumpkin, cinnamon, ginger, and cloves to the remaining batter. Beat for about 10 seconds until incorporated. Use a spatula to scrape down the sides and stir until well-mixed. Take the pan out of the freezer. Carefully pour the pumpkin batter over the lower layer. Add 1 cup of water to the pressure cooker. Place the trivet over the water, with its handles resting on the sides of the pot. Place the cheesecake pan on top of the trivet. Secure and seal the lid. Cook for 40 minutes at high pressure, followed by a 15 minute natural release. Manually release any remaining pressure by gradually turning the release knob to its venting position. Carefully lift the lid to avoid dripping condensation on the cheesecake. If needed, use a paper towel to carefully dab at the cheesecake to absorb any condensation on its surface. Let the cheesecake cool uncovered in the pressure cooker, which should be turned off (not the warm setting). After about an hour, lift it from the pot using the trivet’s handles to continue to cool on the countertop. Cover the cheesecake pan and refrigerate for at least 24 hours. Carefully remove the chilled cheesecake from the pan. Peel off the parchment paper. Slice and serve. 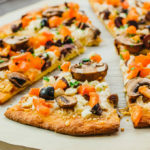 This recipe yields 5.5 g net carbs per serving (1 slice or 1/6th of the recipe). 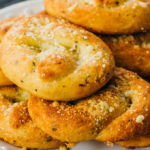 Can this be baked in a conventional oven? 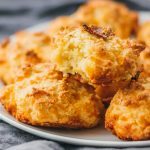 Is there a reason for using hand mixer rather than a kitchenaid mixer? Either an electric hand mixer or stand mixer is fine. No cheesecake mix is wasted here. The remaining batter is mixed with pumpkin to form the top layer. Please read the recipe for more details. Thank you! I read it at least 3 times and missed it. Making it today!! Haha ramekins would work, I just don’t know how the pressure cooking time would change since I haven’t tested that. Have you seen these pumpkin cheesecake bars? Here’s the link: https://www.savorytooth.com/pumpkin-cheesecake-bars/ They’re baked in the oven and are individual sized. Could I rent the cheesecake with foil to prevent any condensation from dripping into the cake? I’m making this next week as a Thanksgiving dessert. I haven’t tried that, but I imagine it would work well. I am camping and using my Instant Pot for the first time camping and have made other cheesecake recipes that were a flop. Literally. This pumpkin cheesecake came out perfect and is delicious. Thanks so much! You’re welcome, Renee. I haven’t taken my Instant Pot while camping yet, but looking forward to trying that soon. I haven’t tested, but generally cheesecake tends to freeze well. Have you tried using any egg substitutes? I have to use a sub. because of my food sensitivities. This cheesecake sounds wonderful! I haven’t tried any egg substitutes, so I’m not sure how they would work. Have you used them previously for cheesecakes? If so, they should work fine in this pressure cooker recipe. There’s no Pin button to pin this recipe?? 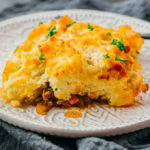 There’s a solid colored bar above the recipe box that says “CLICK HERE TO PIN THIS RECIPE” — click on that and you’ll be able to pin the recipe. Made this yesterday then tackled the swiss steak recipe…they were both EXCELLENT!